Safely convert your CAD files to images on web-servers. 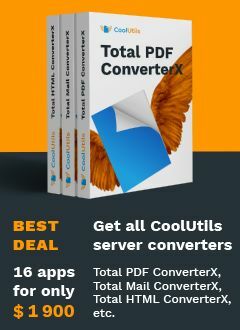 Total CAD ConverterX (SDK) converts CAD files to PDF, TIFF, JPEG, BMP, WMF, PNG, DXF, BMP on web-servers. The program has no GUI or any interrupting messages. The list of source formats is rather wide: dxf, dwg, dwf, plt, hg, hgl, hpg, plo, hp, hpl, hpgl, hp1, hp2, hpgl2, gl2, spl, prn, svg, cgm. 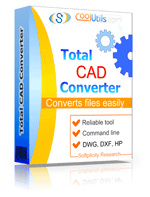 Total cad Converter X (SDK) includes command line converter and ActiveX. convert and combine output files based on the common file name. For example, converting files Qwe 1.dxf, Qwe 2.dxf, Asd 1.dxf, Asd 2.dxf you get Qwe.tiff and Asd.tiff. If you convert large amounts of CAD files on a daily basis you will find these options indispensable. Total CAD ConverterX can easily resize your files during conversion, no additional actions are required. Download your free evaluation copy now and try it on your files. It's valid for 30 days. If you need examples on programming languages please contact us. We will create any example for you. C.Convert "c:\test\source.dwg", "c:\test\dest.pdf", "-cPDF -log c:\test\CAD.log"
"It's been very helpful having this software. We have many old .plt files that we have no way of opening any longer without the help of software like this. I find Total CAD Converter very easy to use. Thank you!" "I use Inkscape to run a laser cutter. Inkscape does export as a PLT file but is very glitchy and more often than not fails. I have used another free converter available but the quality of the exported file was poor - with most curved lines being staggered. Total CAD Coverter converts in a smooth curve and gives many other export options." Supports dxf, dwg, plt, hg, hgl, hpg, plo, hp, hpl, hpgl, hp1, hp2, hpgl2, gl2, spl, prn, svg, cgm files. Converts them to PDF, TIFF, JPEG, BMP, WMF, PNG, DXF, BMP. Has no GUI, perfect for servers and terminals. Preserves original document layout, fonts, curves, colors. Need CAD conversion feature in your app? Get a royalty-free license. It allows you implement Total CAD ConverterX into your software and redistribute it. RFL is licensed per project (no matter how many developers are involved).